I have already shared my favorite uses for vinegar with you and I wasn't kidding when I said that I use it all the time! Now I have another kitchen favorite that I have been using all over my house and loving. Sometimes I even mix it with the vinegar for even more explosive results. Yep, you guessed it. It is baking soda. It helps in about every room in my house and I am going to share some ideas with you. So get this miracle out of the kitchen and put it to work for you! 1. Laundry: I add 1/4 cup of baking soda with my laundry detergent and it has helped drastically reduce odors in my front load washer. It is most noticeable with my fresh smelling towels! 2. Toilet Cleaner: A friend told me about this and it is great. Flush the toilet once so it wets the side. Then sprinkle a good amount of baking soda in the bowl, making sure to cover the sides. Let it sit for 10 minutes and then scrub with the toilet brush. The baking soda deodorizes and is just abrasive enough to give a good scrubbing with scratching the bowl up. 3. Glass-Top Stove: Clean and shine your glass top stove with this little miracle worker. Wipe the stovetop down with a damp washcloth. Sprinkle baking soda all over the surface. Cover the whole surface with wet washcloths after soaking them with hot water. Let it soak for about 10 minutes and then scrub. Anything cooked on will be softened and the mild abrasion will help clean it up without ruining the glass! It may take a few passes with the washcloths to get all the residue off, but when you do you will be happy with the gorgeous result. 4. Grill Cleaner: Put a little baking soda on a damp brush and scrub the grate, then rinse. 5. Freshen Rugs: Sprinkle a little baking soda on the carpet or rug, wait at least 15 minutes, and then vacuum. When it comes up, so will lots of odors. 6. Deodorize the Hamper: Kids toss a wet washcloth in the hamper, or was it the teenagers' socks? Whatever caused the funk in the hamper, you can chase the stink out by sprinkling baking soda in the bottom of the hamper. You can also sprinkle it over the laundry if needs be. 7. Clean Pans: Remove baked-on residue by shaking a generous amount of baking soda on pots and pans. Then add hot water and dish detergent, let sit for 15 minutes and wash as usual. 8. Clean Brushes: Soak hair brushes and combs in a mixture of 1 teaspoon baking soda and a small amount of warm water. Rinse and dry. 9. Shine Floor: To brighten a dull floor finish, dissolve 1/2 cup baking soda in a bucket of warm water. Mop and rinse for a shiny floor. 10. Clean the Dishwasher and Coffeemaker: running an empty cycle with baking soda to clean it out and keep it running better. 11. Shine Silver: To shine tarnished silver, combine three parts baking soda with one part water. Rub onto silver with a clean cloth or sponge. Rinse thoroughly and dry. 12. Soothe the Itch: For relief from bug bites, sunburn and poison ivy, mix baking soda with a little water and apply it directly to the sore or bite. 13. Clear the Clog: Pour in 1 cup baking soda followed by 1 cup hot vinegar to quickly unclog the kitchen drain. 14. 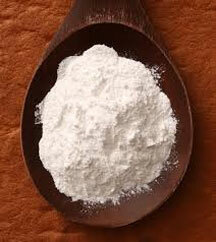 Bathroom Cleaner: Make your own bathroom scrub by mixing 1/4 cup baking soda with 1 tablespoon liquid detergent. Add vinegar to give it a thick, creamy texture. 15. Soft Skin: Add a cup to bathwater to soften your skin. 16. Keep Flowers Fresh: Keep cut flowers fresh longer by adding a teaspoon to the water in the vase. 17. Clean Can: Clean the garbage can with water mixed with baking soda. It will clean it and get rid of some of those odors. 18. Shiny Smile: Use it to clean retainers and dentures. 19. Shower Curtain: Clean your shower curtains by soaking them in baking soda and water. 20. Deodorized Drains: To deodorize a drain, pour about 1/2 cup baking soda down the drain, followed by 1/2 cup vinegar. After 15 minutes, pour in boiling water to clean residue. NOTE: Use this method only if your pipes are metal. And never mix with other cleaning solutions. Don't try this if you've recently used a commercial drain product.